Accredited institutions of higher education in the United States are welcome to submit an application to form a new Chapter of Delta Phi Alpha. If the application is approved, a new chapter fee will be assessed. 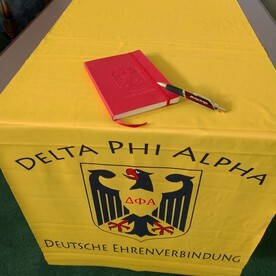 The fee is currently $75 and includes a chapter charter, DPA Branded pen, DPA Embossed Membership Journal, and DPA Branded table runner for display at initiations. Once the charter has been approved, new students may be initiated and after two students have been initiated, the chapter is eligible to apply for funding and scholarships. Article V of the Delta Phi Alpha Constitution discusses constituent chapters in more detail. Section 1. Colleges and universities whose academic standing warrants the maintenance of the standards of the Society shall apply to the National Secretary for a chapter charter and shall be admitted to constituent membership in the society by majority vote of the National Council. Section 2. Procedure for the organization of constituent chapters shall be adopted and/or revised by the National Council. Section 3. Each constituent chapter must have a faculty adviser. It may have its own constituent and/or by-laws for conducting the affairs of the chapter. This constitution and/or by-laws may raise, but not lower, the minimum requirements for membership as specified in Article VI. Section 4. To remain in good standing a chapter must pay the national membership fees of its members together with incidental bills to the National Treasurer and have initiation of members at least once every two years.